It will be cloudy weather in Southport today. The temperature is expected to peak at around 15° C (but it will feel like 12° C due to the wind chill factor). The odds on it pouring down today are high (around a 78% chance). If you are going outdoors it would be a good idea to take an umbrella. Humidity will be approximately 58%. The UV Index is 2 (low). Suncream is not necessary. Visibility today is good. Stand in a place with a good view and you should be able to see for 10 to 20 km (6.2 to 12.4 miles). Wind speed (noon) is estimated at 11 mph (gentle breeze). It will be blowing east south east. It will be partly cloudy in Southport tonight. The minimum temperature is going to be 8° C (but it is going to feel like 6° C). There is a good chance it will rain tonight (52 percent to be precise). Humidity will be around 77 %. Light rain showers are forecast for Southport tomorrow. The maximum daytime temperature will be around 13° C (it will feel like 10° C). A downpour is more likely than not (roughly a 83% chance). Humidity tomorrow is forecast to be around 71%. The visibility level in Southport is expected to be moderate. You should be able to see places as far as 4 to 10 km away (2.5 to 6.2 miles). The wind speed tomorrow at noon is forecast to be 16 mph (moderate breeze). The wind direction will be south. A 5-day weather forecast for Southport is shown in the table below. 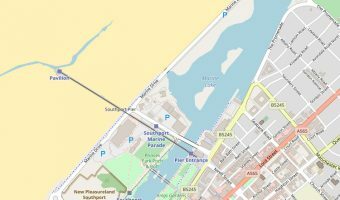 The weather forecast for Southport is based on data provided by the Met Office for the location shown on the map below. The weather in other areas of Southport may vary slightly. This is because the Met Office forecasts that at noon today in Southport it will be cloudy with a 78% chance of rain (more likely to rain than not). Premier Bowl and Laser - Ten pin bowling and entertainment centre at Ocean Plaza, Southport. Vue Cinema Southport - 8-screen multiplex cinema. 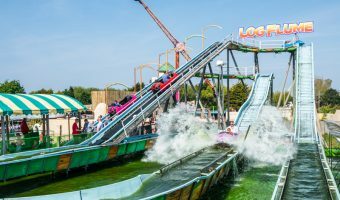 Splash World Southport - Indoor water park. Comprehensive tourist guide to Southport. View sunrise and sunset times for Southport.